Get a head start on fright night. Back in our day Halloween was not much more than knocking on the neighbours' doors and essentially begging for sweets. These days however, it seems that kids expect a bit more from the creepiest night of the year, with parents creating long lists to get their homes, and themselves, set for the 31st. 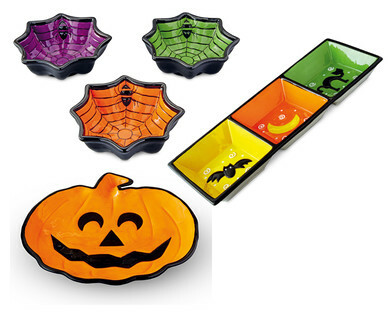 To that end we've selected a few cool products to help make Halloween go with a bang. We mean, BOO! Just when you thought you've seen pretty much every occasion and activity covered by the supermarket chain, they've gone and nailed Halloween. Available from 1st October, and for a limited time only, their new Halloween range is pretty comprehensive and covers all the bases. The night will be sewn up if you dip into this range, which includes costumes for the kids, decorations for the home, and also tonnes and tonnes of sweet to dish out to trick-or-treaters. 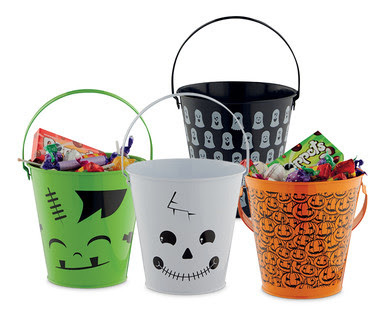 Your own kids will need something to carry home all that sweet booty, and these little buckets are great. They're metal, feature a handle, and are printed with a mix of spooky designs. And slap our arses, they're just £1.79 each. These ceramic dishes are great to keep your sweets ready for the next batch of door-knockers, coming in either a three pack of smaller side dishes, or a choice of the pumpkin or triple dish. 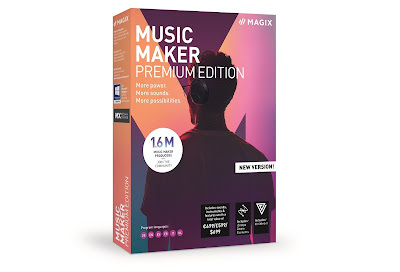 £6.99 each/per pack. Give these a knock (or a press) and prepare for a scare. 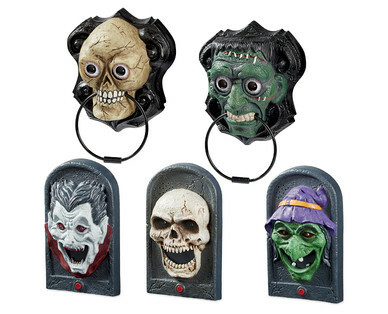 The door knocker we were sent (the skull one) is actually very loud and frightening. Good for scaring the crap out of your neighbourhood kids then. £6.99 each. 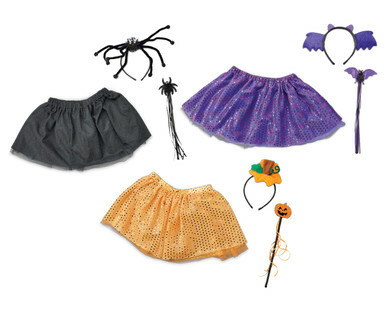 Great for adding to costumes, or for building one around, these tutu sets come in three different designs, include a head piece, and also a wand. £1.99 each. 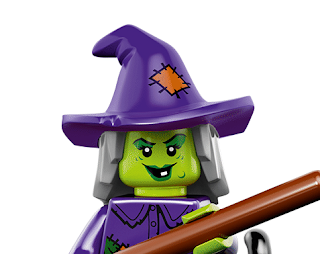 With their release just before the spooky season, LEGO's latest multifigure series is all about things that go bump in the night. In creating the 16 all-new characters, LEGO's designers have drawn inspiration from classic horror movies and folklore, as well as a few modern tales of ghastly goings-on. 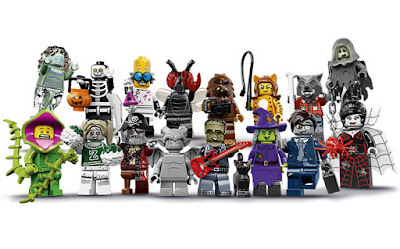 Amongst others, there is a Monster Scientist, three different kinds of Zombies (one of which is having some difficulty getting service at the Kwik-E-Mart below), a Gargoyle, a spectral Banshee, a Spider Lady, a Monster Rocker and, our favourite, the Plant Monster. The individual blind bags always make great - and very random - gifts for kids, who can collect the full set and swap the duplicates with friends. These are a perfect gift to help make the house a bit creepier in the run up to the 31st, or as an alternative to giving out sweets. Part weird decoration, part toy to get the kids excited for Halloween, this unique model from Playmobil is tonnes of fun. 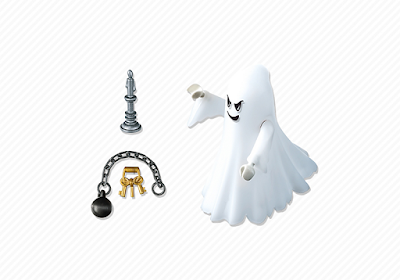 An articulated action figure in his own right, the ghost also comes with typically spooky accessories in the form of a ball and chain, keys to jingle, and a candlestick. 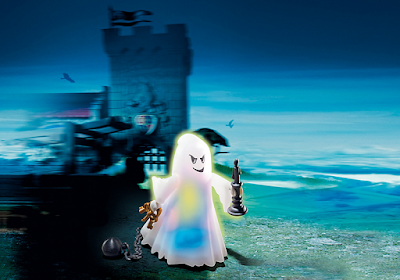 But, flick the switch on his base, and the ghost eerily glows. You can choose between flickering white light (classic ghost, we call that), or a more funky colour-changing mode which cycles through the rainbow. This is a pretty good setting if you're having a disco-themed Halloween party, or wanting to play with the ghost of Disco Stu. This a great decoration to place in your window on Halloween, next to you pumpkins of course. To welcome in the hordes of kids.